There are many ways to grow your cannabis plant indoors. The two core methods of indoor growing are soil growing and hydroponics. There is a separate chapter for hydroponics, and so this chapter will deal with soil growing. We will discuss these methods in a moment but let us first see what they all have in common. Lights come in all shapes, sizes, wattage and type. A full indoor grow lighting kit should contain the following items. Bulb, reflector, ballast, timer and electrical inputs/outputs. Most lighting kits are open, meaning that no hood or glass will cover the bulb. It hangs directly under the reflector. The bulb is fixed into a socket that is attached to the inside of the reflector. That socket is connected to the ballast. The ballast can be internal or external. If external there will be a cord leading to the ballast from the bulb's socket. The ballast plugs in to a domestic light socket like the one you have in your home. Some ballast types even have a built-in timer. When buying a lighting system it is recommend that you buy a complete system and an extra bulb. Check to make sure that the lighting system meet safety regulations and has some sort of guarantee with it. Light can be separated into a spectrum, which form the colours of the rainbow. Red, Orange, Yellow, Green, Blue, Indigo, Violet. Each of these lights mix down to give white light. Artificial lights, because of their nature, tend to lean towards a tint of one of these colours when they mix down to form white light. The electro-magnetic spectrum is a term used in lighting to describe the distribution of electro-magnetic radiation by reference to energy. This table roughly gives wavelengths, frequencies, and energies for parts of the spectrum. You may find it useful. Plants are green, which means that Plants absorb light at the middle of the spectrum. Cannabis plants need this part of the light spectrum to reach full growing potential. The intensity of the light is also important. A light that feeds the full bandwidth with all light spectrums will work very well - like sunlight. When dealing with artificial lights it is better to choose a light that concentrates its intensity on the top part of the spectrum. The most common indoor light systems are called HID lights. These lights are professional horticultural lights. They are developed by horticultural lighting companies and are tested to suit growing plants indoors. These lights are commonly called HID (High Intensity Discharge). Like the former lights these also come in kits with bulb, reflector, ballast and timer. They also come in different wattage and different shapes and sizes. If you want to grow good bud then you need a HID. A HID is the second most important purchase you will make next to choosing your strain. The lights are HID lights and are used for the seedling and vegetative growth stages of your plant. They can also be used for flowering and are quite good too. They come in all shapes and sizes and range from 75W - 4000watts. These lights are very common and are a good kit for the indoor weed grower. Mercury Vapour is not as comm on as it used to be. It has almost been replaced by Metal Halide now. If you have a choice between the two it is best to stay with the new MH kits. MV also has a tendency to be slightly out of the optimal spectrum range. This is the lighting choice of many a Cannabis Cultivator. 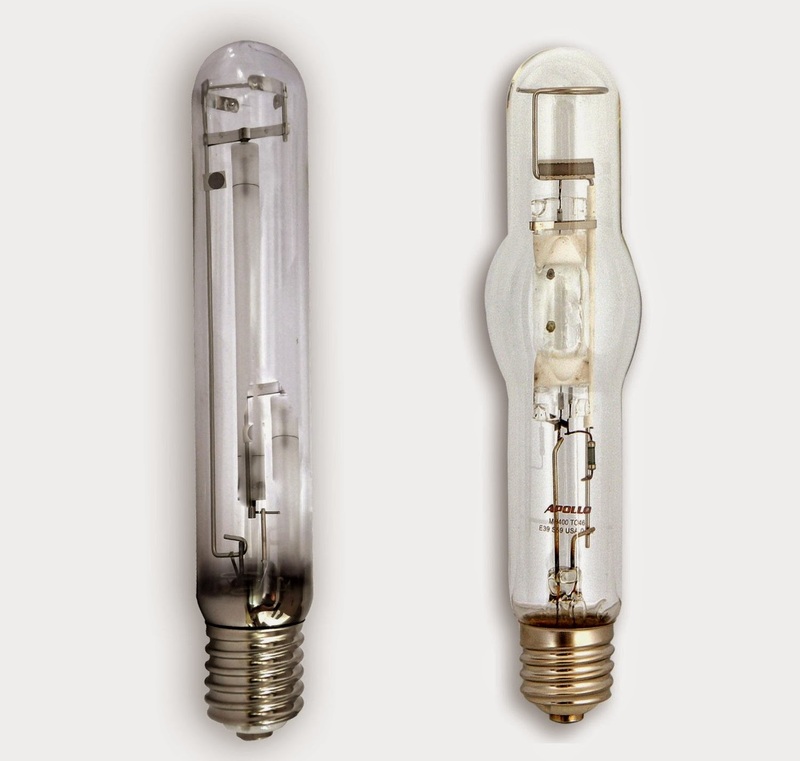 These lights come in all shapes and sizes and have a range of 75 watts - 4000 watts. These lights are in the perfect spectrum for growing weeds and come highly recommended. Now for the big question. How many Lumens do I need? How many plants do you have? How big is your grow area. You do not want to go less than 2500 Lumens, even for one plant. You want to get the best so you need to hit the 45000 mark or more. In general one light that casts 45000 lumens is enough to cover a workspace of about 3 feet by 3 feet. This is quite an average space and you will probably get anything between 6 - 9 plants in that area. Again we must keep in mind the strain that we are growing. One large sativa plant can cover a 9 square foot grow area in no time. Short indica plants are different. You can get maybe 12 plants into a 9 square foot grow area. If you really want to pump up your plants then you may consider a lamp that casts 100,000 Lumens or more. 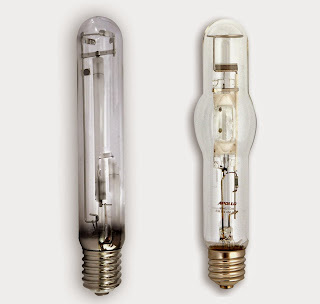 If you want a bigger grow area then you may consider 2 lamps that cast 100,000 Lumens each. 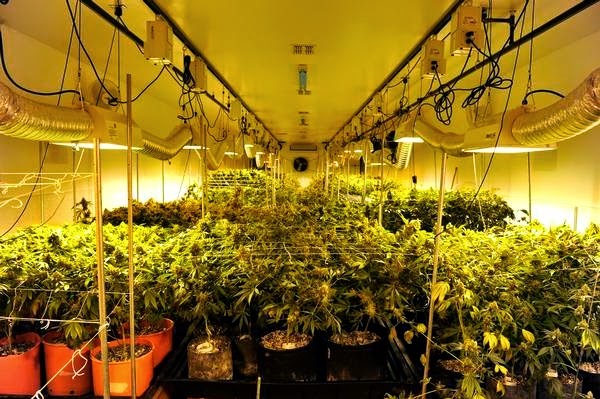 All is relative to how much you want to grow and the size of your grow room. Let's say for the record that we would like to grow 4 plants. Then what we should aim for is a light that casts 45000 Lumens. This means we should buy a 600-Watt HID system. Let's say we want to pump up our available light to around 60,000 Lumens. This means we should buy a 1000-Watt HID system. If our area is bigger we might need 2 or more 1000 - watt HID lights to achieve this. It all very respective to the 3 elements we men tioned above. There is nothing wrong if you want to use a 1000 - watt HID light on 2 plants. They will grow bigger and better. The only thing is, do we really want to spend all that money on the light and the electricity bill? HID lights range anywhere be tween $220/£200 and $700/£670 for a full kit. You may be able to buy the parts and build your own, but this is only recommended if you have some experience with lights first. A 600W HPS kit should cost about $250/£230. This is money well spent if you want great plants with big buds. Over time you will understand more about grow rooms and how to light them properly. With experienc e you should be able to tell what light suits your needs. As a general rule, when in doubt buy a 400W HPS or better. Soil comes in many types and varieties. What you will find as you go along is that you will add various ingredients to your soil to improve plant growth. 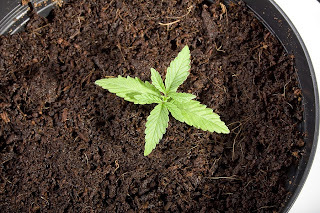 The Cannabis plant will grow long and winding roots into the soil. These roots absorb water and other minerals from the soil to help it grow. The soil also goes through dry periods when you do not water your plant or when the plant has absorbed most of the water. During these dry periods air is allowed to creep in between the soil particles, allowing the roots to breathe. There are 3 main factors to look at when buying soil: pH, Nutrients and Structure. pH is a way of measuring how much acid and alkaline is in the soil. The pH scale runs from 1-14. 7 is neutral, 0 is very acidic and 14 is very alkaline. Cannabis plants in soil like a pH of 7. When choosing your soil you should be looking for a pH of 7. It should tell you this on the bag. Going above or below this mark can cause your plant problems during growth. Small pH meters can be bought in most gardening shops and can be used to measure the overall pH of your soil. The three major nutrients that are found in soil are Nitrogen, Phosphorous and Potassium or NPK for short. NPK can come in two forms - with the soil or as a stand - alone fertilizer (usually in a bottle). When you look at the bag you will see that the % of each part is stated. Such as 20:20:20. This means 20% N, 20% P, 20% K. The remaining 40% is just other elements that make-up the soil. In liquid it would usually be water. This ratio can change between different types of nutrient and soil brands so we need to understand what Cannabis likes. Cannabis plants like good levels of N and a normal level of P and K during vegetative growth. You need to pick a bag that has all three, not just 10:20:0. When looking at chemical fertilizers you need a mixture that has the first number higher or equal to the rest. 12-12-12 is fine, 20-20-20 is fine, 12-6-6 is fine and 18-4-5 is fine. The 12-12-12 and 20-20-20 are the best ones to find. Something like 8-20-20 is not suitable for vegetative growth. Bags with higher P are for flowering plants. As a grower we do not transplant to new soil for flowering. We simply use plant feeds to bring up the P levels during flowering. Try to find a soil that is not too moist. In other words try to find a soil that dries out well and does not hold water like mud. It should say on the packet whether the soil is a wet or dry one. Try to find a balance between the two. Wet soil will sometimes cause plant damage because your roots need air to breathe. Dry soil may also dry out too quickly and needs to be watered more often. Try to find a soil that is loose and feels fine but slightly heavy in your hands. Basically the soil structure is up to you. Do not buy anything that is hard and bulky or too soft and weightless. Medium Soft and heavy is what you want. So at this stage you now have the best soil that you can get your hands on. You take the seedling and make the transplant. You fill in the empty areas of the new pot with more soil. You pat down the top of soil lightly and you apply the stake if needed to support your plant. You also add a small amount of water to your plant and you place the pot on the bench under the light. You will leave the light on 24 hours a day and watch as your plant grows over the weeks from its seedling cycle to its vegetative state. During your plants vegetative cycle it will begin to grow quickly and produce more leaves and new branches. The stem will also grow thicker. This is when your plant begins to look like a marijuana plant. Water your plant ever second or third day or better still when they dry out. Never let the soil dry out completely for long periods of time. I find that the following method works best with good size pots. Day A - watering, Day B - let dry, Day C - let dry, Day D - check soil and water if needed. This really does depend on the size of your pots though. If you pick up your pot when it is dry and pick up the same pot when it is has been watered, you can tell the difference in weight. This is a good way to judge if your pots need water or not. It is easy to see signs of over-watering. Watch your plants after you have watered them for the next 2-3 days. Do the fan leaves point outwards to receive more light? Or do they wilt downwards and look like claws. If they wilt then you may be under-watering or over-watering. Check the soil. Is it dry? If it is then add more water. If it’s wet, then leave the soil dry out for more time until your leaves pick up again. You will eventually understand more about your plants needs as it grows along. What you need to do is form a pattern or relationship with your plants watering needs. 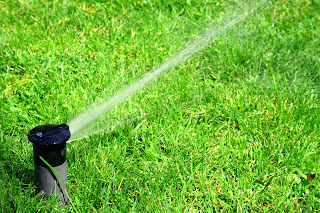 Over-watering does kill plants if the watering continues. If this happens let it dry out and hope for the best. Use a fan near the surface of the soil if you can. You may find that you need to water everyday because your light may be discharging a lot of heat. Your plant needs all the light it can get in vegetative growth. Leave your light on 24 hours a day and enjoy watching your plant as it grows. If you have a good stand or light support you will be able to lower or heighten your light. This is great because the closer your light is to the plant the more light it will receive. However make sure it is not too hot or it will burn your leaves. If you can keep your hand at a certain area under the light and not feel discomfort then your plants should do okay too. If you feel discomfort, so will your plants. Use common sense and adjust your lights accordingly. 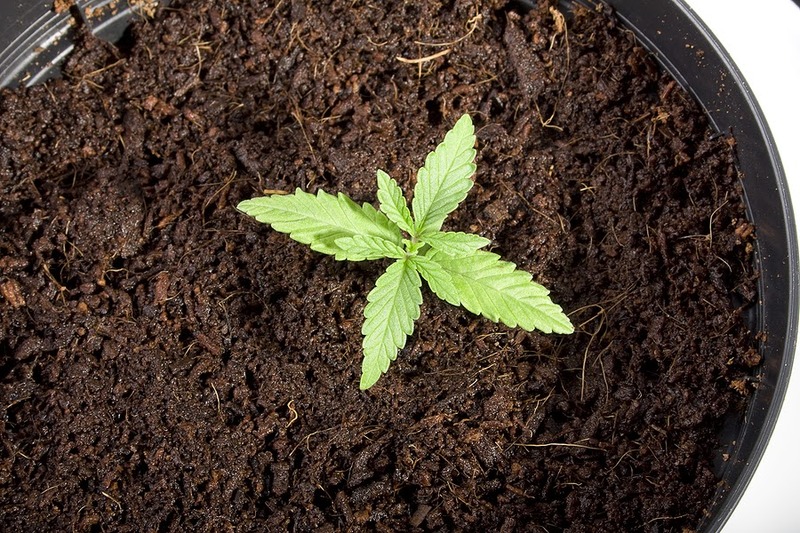 Some Cannabis plants can grow as fast as an inch a day! So you need to watch out that your plant does not push up against the light. Be safe and know your plants grow rate before attempting to place your light very close to the plant. If you do suffer a burn use a pair of clippers to remove the burnt areas. This is only advised for light burns and not for soil or nutrients burns. Cocaine Drug Test - How Long to Pass a Urine Analysis? Does Synthetic Urine Work to Pass a Drug Test?